The flavor will be rich, but with sweet, sour, hot and salty notes. The texture will be creamy, but with soft pieces of avocado and tiny crunch from the minced shallots. Add a crispy tortilla chip or veggie to the mix and you are in business. Not bad on top of a burger or with chicken, either. 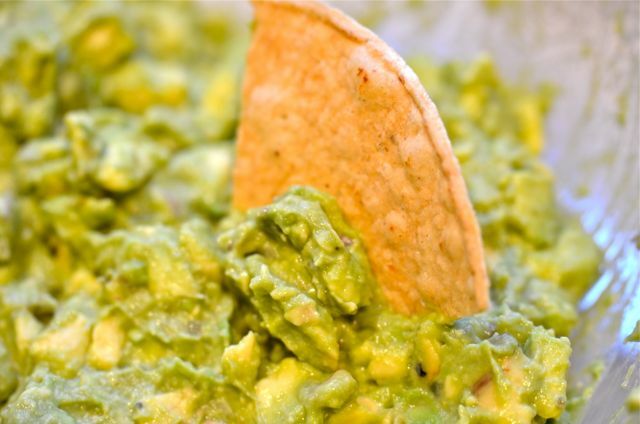 This guacamole may seem almost plain compared to some recipes, but if you like avocados this recipe may be worth a try. And you can always serve some salsa in a separate bowl… 😉 Go Niners! 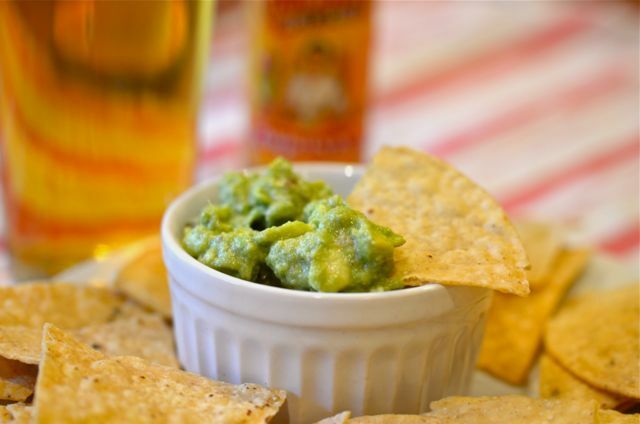 Hass avocados have the highest oil content of any avocado and simply make the best guacamole. Use them if you can, regardless of the recipe. The best way to remove avocado pits is to cut into them with a solid tap from a chef’s knife (it will stick in the pit) and then twist. You can protect your hands by holding the avocado in a few layers of a kitchen towel. 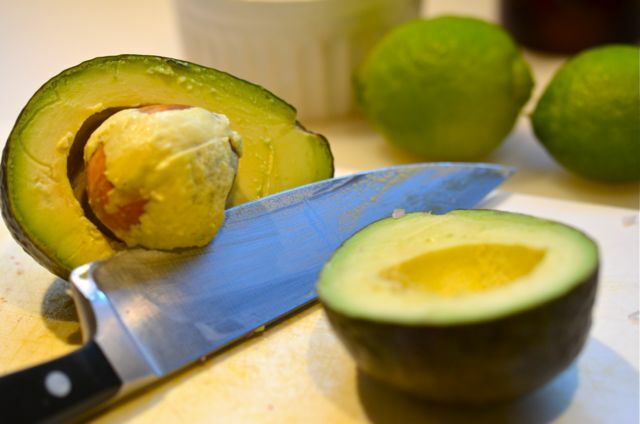 You can dice avocados while still in their skin, using a dull butter knife. The knife will cut the avocado flesh but not the skin (yours or the avocado’s). 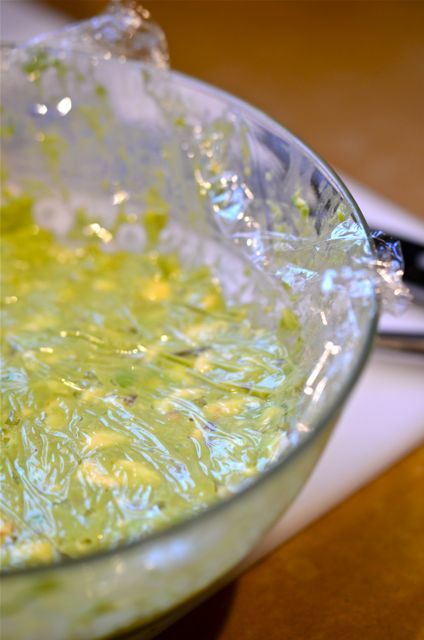 When storing guacamole in the fridge, press plastic wrap or wax paper directly onto the surface of the guacamole. This will keep air from reaching the surface of the guacamole and turning it brown. The avocado pit trick doesn’t work. 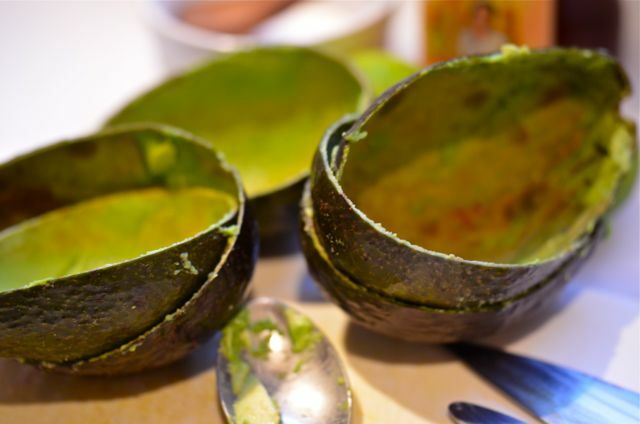 What You Get: A very clean and rich guacamole that highlights the avocados. What You Need: No special equipment required. But if you don’t have very good Hass avocados, make something else. How Long? About 3 hours with only 10 minutes of active time. You can skip the extra time in the fridge, but it will be better if you wait. Cut the avocados in half lengthwise and remove the pits (see notes). 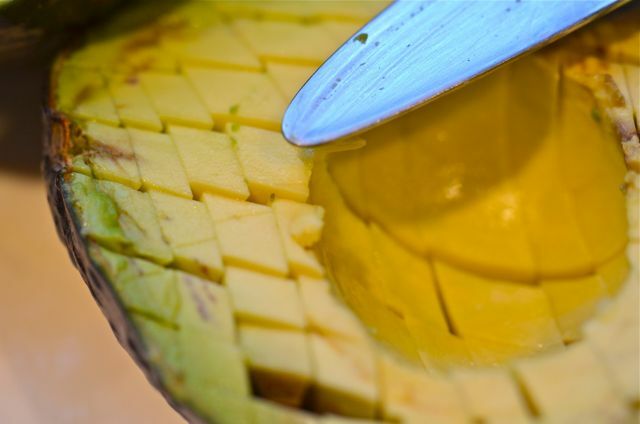 Using a butter knife, dice the avocado while still in the skin, cross-wise and length-wise into 1/4 inch pieces. Then scoop out the avocado pieces into a medium bowl. Add the shallots, salt, pepper, lime juice and hot sauce to the bowl. Lightly fold the ingredients so they combine, but some chunks of avocado remain. Taste and lightly adjust seasoning. Then cover the surface of the guacamole with plastic wrap and refrigerate for 2-3 hours. Remove the guacamole from the fridge. Taste and adjust seasoning. Serve with chips or crisp vegetables. Garlic and cilantro will work really well. The shallots are a mix of garlic/onion, so I would start with a little less garlic and then add more if needed. ah ha–that clears it up. Was starting to ponder the great philosophical Q of “If there’s not cilantro in it, is it really guacamole?” Will give your recipe a spin. Looks great! Mine is very similar, but with cilantro, rinsed onions instead of shallots, lime juice, and chopped jalapeño peppers. I agree though: no garlic in the guacamole! 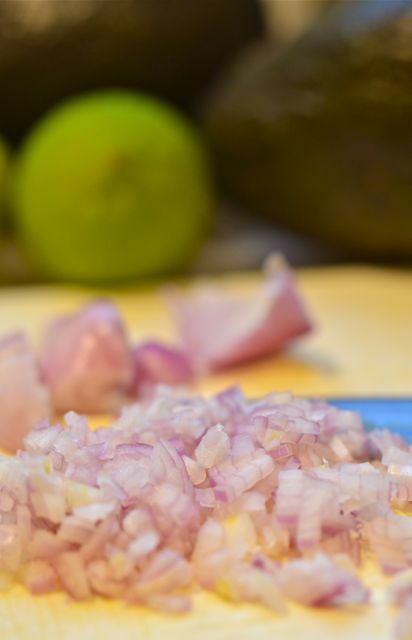 The rinsed onions are a very good idea, a little sweetness but knock down some of the sharper edges…same with shallots. I found this out from a scientist friend of mine that those who have an aversion to cilantro have a gene turned on that is extra sensitive to its “soapy” aspect. Some people don’t taste that in cilantro at all. I have it too, but I have learned to embrace it 🙂 Now if I could only get over my aversion to small, oily, fishy fish. Perfect guacamole! I love that you use shallots – also that you leave it to mellow, that is a great idea! I make mine very simple too…just salt and minced garlic. maybe next time i will add the shallot. I serve mine immediately upon making because i dont want it to be cold but i think i could refrigerate it for those 3 hours and then remove 1/2 hour before serving, leavin on the plastic til just prior to serving. Thanks! And you are right about the guacamole coming back toward room temperature…we will update the recipe. Thx! 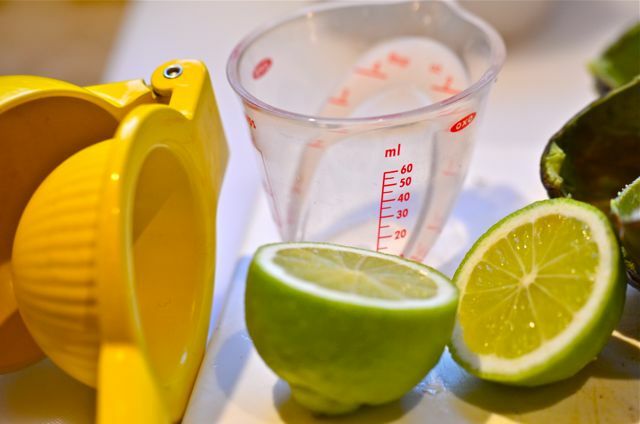 I have to say, not only are your recipes superb, but the whole visual package of your posts is inspiring, thank you. Thanks for the visit and kind words. We do have fun putting this all together…and we get to cook…all good! I discovered what guacamole should taste like when I picked up a “guacamole kit” at Trader Joes. Fresh limes, a shallot, a clove of garlic, a jalapeno, a plum tomato, and a few avocados. Combine all that with some salt. That was amazing–to the whole family. My daughter even demo’d making guacamole for a speech in class last year. I planted shallots in the fall and I look forward to making this with them when they are harvested come summertime. 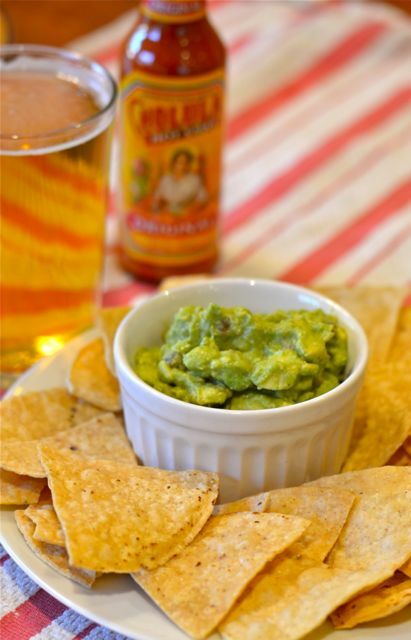 Guac is a great crowd pleaser. I’ve only ever met 1 person that didn’t love guacamole. When I go to take the pip out, I lay the avocado on a chopping board instead of holding the avocado in my hand so that there’s zero chance of missing and cutting myself. It freaks me out to cut myself so I guess I avoid the possibilty as much as possible. I had never heard of avocado + salsa = guacamole. I like your recipe much better, although I suppose a bit of chopped tomato, garlic, and just a tiny bit of cilantro won’t hurt. I only hate cilantro when there’s too much of it. 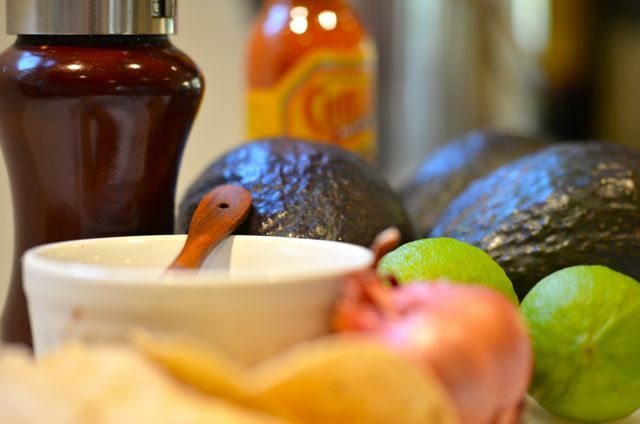 The “avocado + salsa” recipes tend to come from the use of substandard avocados. If the avos are good, you really want their flavor to lead. We have a family member who hates cilantro, so we avoid it, but a touch is very good. 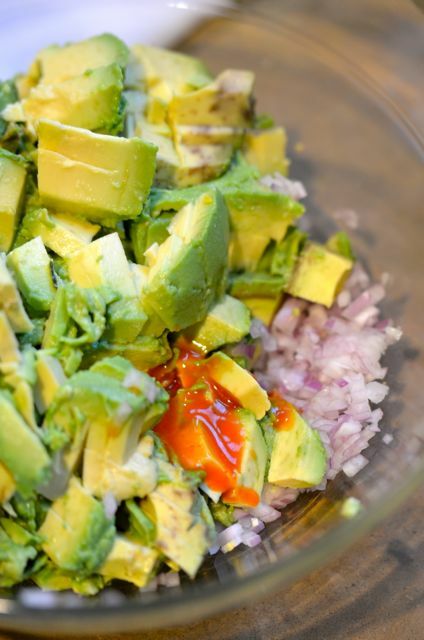 This is so good … home make guacamole … nothing can beat it. I done your recipe before. I love it on a new toasted bagel with grilled bacon, sour cream and thinly sliced red onion – we don’t do bagels in Sweden .. wonder why??? Thanks. We eat guacamole a lot with fresh veggies or with a basic bowl of fish and rice. Always a treat. I know … can’t even find them frozen … same with KFC – we don’t have that neither .. but we have Pizza Hut, same company. Very strange. Like guacamole with fried fish .. and I promise I do the best Fajitas outside Mexico. http://wp.me/p293Pw-f8 – we sold tons .. of it. That was awesome! Thanks for sharing…my kids will love this too! Yeah, it’s a kid thing! And avocados are so inexpensive right now! 🙂 Yea! Thanks, I just made that dip and it turned out great!! Very easy to make and sooloooooo tasty!! Had mine with Jamaican water crackers. Thx. Perfect – thank you for the tips and recipe! I love (LOVE) avocados, but I am a “lone reed” in my family on avocados, so when I buy one, I usually just eat it plain, all by myself. I also happen to have a now-fading aversion to fresh cilantro. It IS a sensitivity to the soapiness, and mine came from a day of pulling volunteer cilantro sprouts from among a nearby strawberry bed. My hands reeked of *that* aroma for a good long while – fortunately, that episode was many years ago, and I’m working to overcome the aversion, but it takes conscious effort. Good luck to the ‘niners! I am surprised you are the only avo fan in the family. It is one of the “vegetables” we can always get kids to eat! Great recipe! I like the idea of adding hot sauce, saves chopping a chilli! Thanks! (We get lazy that way, but if you like a specific hot sauce you do get to control the flavor).